One of our Bay Area experts, Jeffrey Caldwell, sent out an email to the Yahoo Group recently. He was reading an old issue of Pacific Horticulture from 2003 (I was impressed that he’d kept his stash intact for so long!). He said that in Volume 64, Number 2, an article titled “Bees in the ‘Burbs'” called out some research in North Berkeley and Albany about native and non-native bees, and their plant preferences. One idea that caught my attention was that two different species of the same genus might attract different sets of bees! 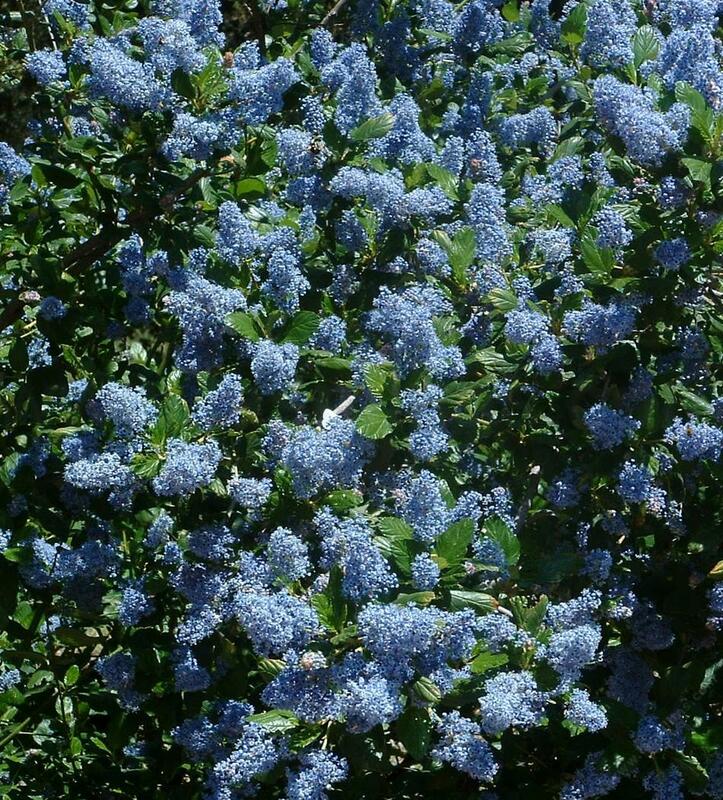 I’d love to hear from any other observers of these two Ceanothus species. Do you see native bees on both? Does your ‘Ray Hartman’ only attract native bees? Thanks to Las Pilitas Nursery for the use of the photos. 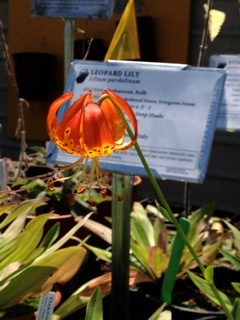 Our readers can’t seem to get enough of the Leopard Lily (Lilium pardalinum), based on comments and blog traffic. 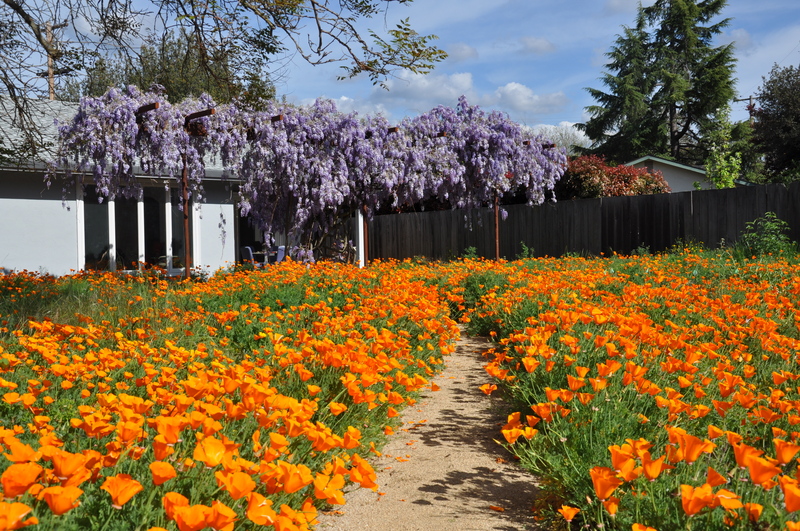 So, here is another bloom shot offered by Kristen Hopper of Oaktown Native Plant Nursery. I am in San Diego and envious of this Norther California beauty. In the past, I’ve tried growing it in a pot (knowing full well it is not of my local plant community by any stretch of the definition) because I love those colors. But I never had any luck with it, so maybe it is just as well that I let this one go and just admire it from afar. 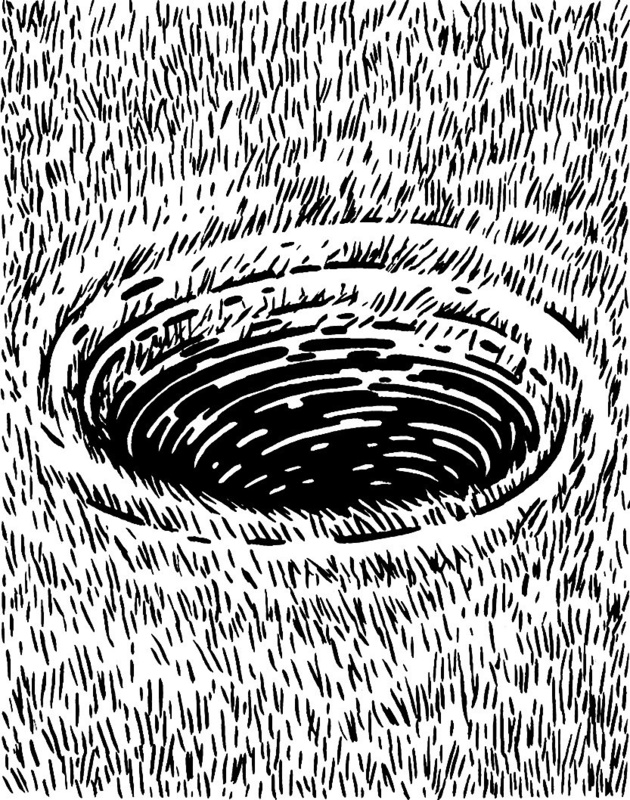 Daniel Fink, longtime Theodore Payne Foundation supporter and past board member, wrote a short and snappy letter to the editor of the New York Times which was published the other day. I don’t read the New York Times, but one of my old technology buddies does get it, spotted the mention of native plants, and passed on the link to me. Thanks, Kevin! The gist of the Times article was that we weren’t conserving as well as we could under voluntary rules. Here is the link to the full article: “Forceful Steps Amid a Severe Drought” (news article, Jan. 16). 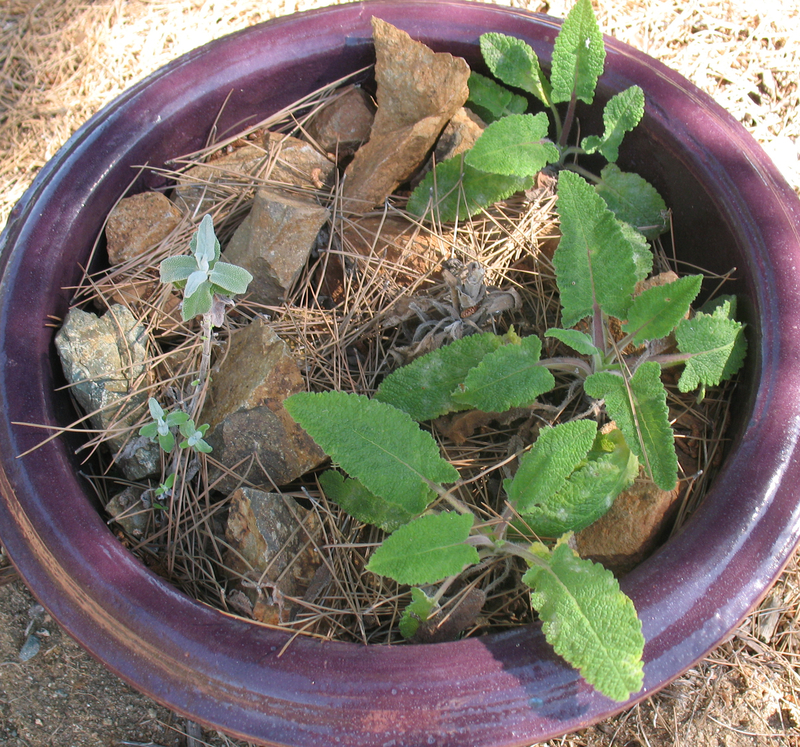 I’m not great at propagation, but Salvia spathacea seems to be OK with my level of capability and generously has agreed to start growing in a pot. I plunked this in a smaller pot several months ago and just transferred it to this glazed 9″ in diameter heavy clay vessel. It is an odd shade of purple, so I am expecting that the magenta of the Salvia blossoms will look pretty funky against this background. I mulched the soil with small granite rocks – there are literally TONS of these three-quarter inch to one inch nuggets on my property. I use them to mulch everything. Fortunately I have always loved rocks – one of my best birthday presents when I was in elementary school was a genuine rockhound’s pick from Grieger’s – the professional’s source for tools at the time. So, having a garden full of native plants and rocks is, for me, paradise! 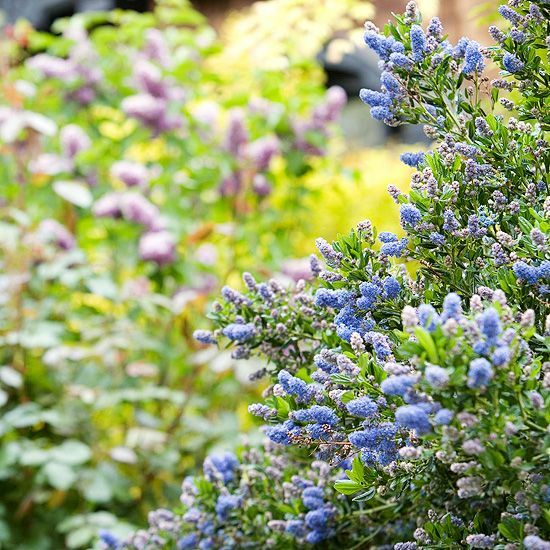 I love Pinterest and recently, I saw a pin that was of our dear Ceanothus – and it was pinned by someone who snagged it from the Better Homes and Gardens site! Sub-title: An experience you may not get from seeing native plants in the wild! We re-did our back yard landscaping in winter of 2011-2012. We expected to have a few sparse years but apparently our soil contained plenty of California poppy seed waiting for the opportunity that expanses of bare ground provided them. We’ve had two springs of saturated orange color from the thousands of poppies but we have other plants to enjoy as well. After the landscaping was done, my wife Lesley planted a dozen soap plant, Chlorogalum pomeridianum. The first spring, most survived and one plant produced flowers. This year, four of the soap plants bloomed. The leaves of the soap plant don’t get far above the ground so when the plant begins to produce a four to six foot tall stalk, it is a very dramatic announcement of things to come. When the flowers appear, they are worth the wait. Every evening starting in mid-May, a few blossoms open. The flowers begin to open around 5:30-6pm. and are fully open by the time twilight fades into night. The flowers have begun to wilt before we get up in the morning. Producing flowers that only last through one night seems a chancy survival strategy, but it seems to work for this plant. In our Walnut Creek Open Space, soap plants hold their own in grasslands dominated by alien oats and rye. The flower buds are elongated striped ovals like small beans. The soap plant flowers are fairly small and mostly white but they have a very elegant design. From a distance, the flowers look like feathers in the soft evening light. Up close, the curve of the petals, the shape of the flower parts and the color of the stamens are striking. Captured in a picture with a closeup lens, the flowers will give pleasure for years to come. If I want to see this show, I have to be out watching the plants as the light fades. That’s hard to do in park and open space areas that are closed to visitors at night. Having the plants blooming in our backyard lets me enjoy the blooming process at length night after night. One evening, I was able to watch a flower bud as it opened over 4 minutes. Click to watch Bud opening! I love taking pictures of flowers so this year I spent several evenings trying to get good pictures. There is not much light at the end of the day so shutter speeds are very slow. Since there is usually a breeze at that time of day, I get lots of blurry pictures. Sometimes the breeze blows the flower completely out of the frame and I get a picture with no flower at all. If I remembered to get outside early, took plenty of pictures and had good luck, I’ll have some keepers when the light gets too dim for pictures. I have wondered what sort of pollinators would visit the flowers during the night. Some people suggested moths or bats as the pollinators. I never saw either of those but I have seen yellow-faced bumblebees coming for a nightcap before the light faded completely. The plants were finished blooming by the beginning of June but there are lots of seed pods growing on the plants now. We’ll have more plants and a bigger show in a few years. Bill Hunt is the Chapter Council representative of the East Bay Chapter and a board member of the California Native Plant Society. 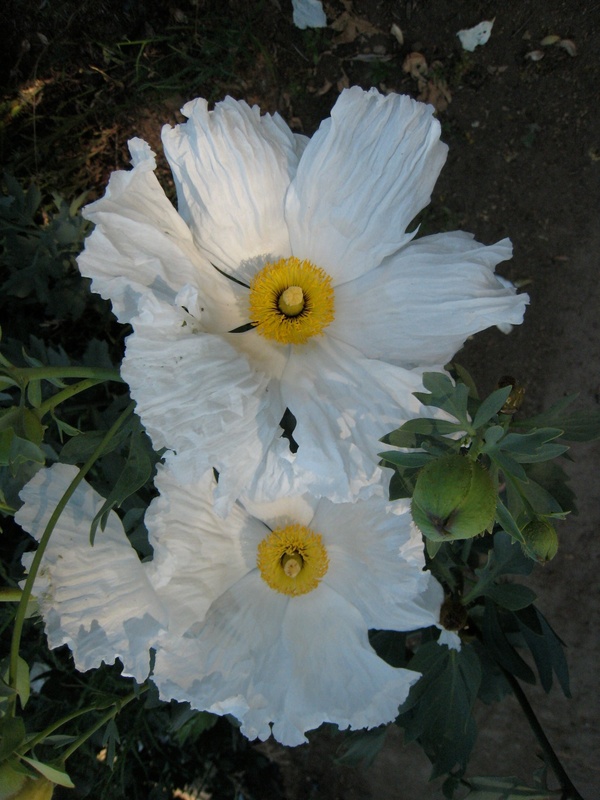 Matilija Poppy, unique and distinct, is one of the most recognized and beloved of California’s native plants. The large white blooms are the size of a saucer. The petals look like wrinkled crepe paper, the center is a bright yellow disk. Some have likened the flower to the appearance of a fried egg. A solitary bloom is a very fine thing, but a large stand of Matilija in full bloom is a sight to behold! Hundreds of huge white flowers borne at eye-level on long straight stems, contrasted by attractive blue-green foliage… a real show stopper in late spring/early summer! 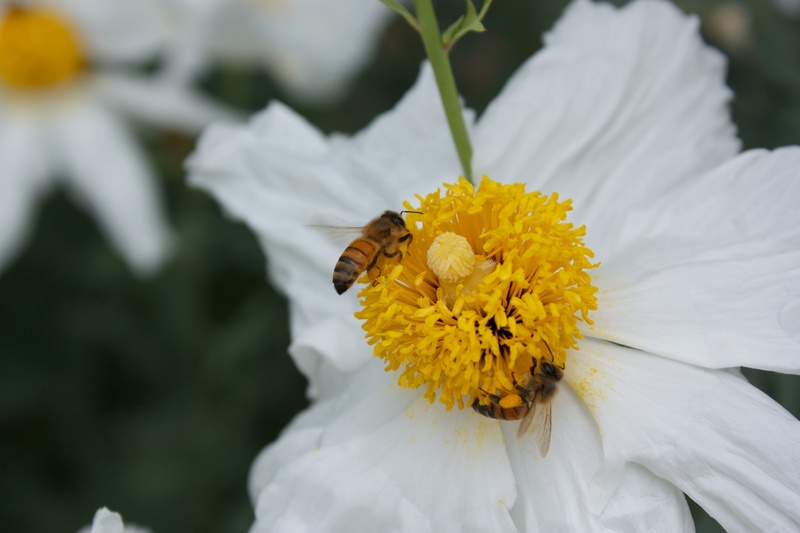 Matilija poppies are only found in a few locations in California. Within their range, they prefer gravelly soil, sometimes on the sides of stream banks or alongside a road. Their appearance always seems a surprise, as they are not common. They can be found in sunny chaparral and coastal sage scrub in coastal and inland regions of southern California. While easy to grow in the garden, in the nursery, the species (Romneya coulteri and R. trichocalyx) are difficult to propagate. Seeds will not germinate unless they have experienced the flash heat of wild fire. At Tree of Life Nursery, pine needles are ceremoniously burned across the tops of the freshly sown seed flats. Germination usually begins within a few days. Seedlings are tiny and they are vulnerable to the elements. The best garden variety is a supposed hybrid between the two species. Theodore Payne first discovered it in a southern California nursery in 1940. The selection he made had much larger blooms, attractive lush foliage and a slightly more compact habit than the species forms. He introduced it as ‘White Cloud’ and first offered it for sale sometime before 1956; the exact details are now lost in history. At one time the hybrid plant was all but lost in California horticulture. In the early 1970’s, Art Tyree (who had worked with Theodore Payne in the 1960’s) knew of a stand of ‘White Cloud’ growing in a private garden in Pasadena. Tree of Life Nursery obtained permission to secure a few small root cuttings. Since ‘White Cloud’ is a cultivar, it must be grown vegetatively. Seed would not be suitable and stem cuttings are practically impossible. From those few cuttings thirty years ago Tree of Life Nursery has planted and maintained large stands of mother plants, of the exact clone that Payne had selected almost seventy years ago. 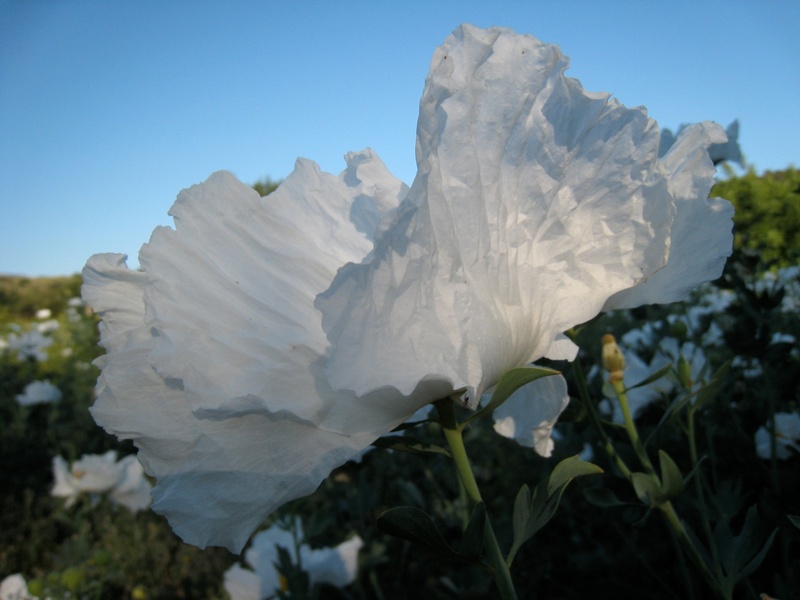 Matilija poppy is a clumping perennial with long, upright blue-green stems and foliage. Plants reach 5 to 8 feet tall and spread by underground stems to form large colonies. The plants can be difficult to establish in a garden, but once established will thrive. Don’t plant anywhere where the vigorous spreading from underground runners would not be welcome. Transplant carefully in cool weather to avoid disturbing roots and provide monthly watering and well-drained soil. The plant is drought tolerant and will not survive continually wet roots, such as in the middle of lawn (yes, this has been attempted). Matilija Poppy looks beautiful in roadside and parkway plantings, along fencelines, on slopes, in large scale planters and borders, and as an accent for entrances. Cut it back hard after flowering (September-October) to remove old stems and allow for new spring growth.